Amazon has been offering Shame Nation as a special price. Don’t miss this opportunity, order your copy today and pick up one for a friend or relative! Internet safety, cyberbullying and bullying is a major concern for people of all ages. Whether you’re tween is being harassed online or in school, or maybe a teenager that is being mocked on Facebook or any social media platform, as a parent it’s your job to try to be involved as much as possible. This isn’t always easy, which is probably why it’s topping the highest health concern among parents according to a new national poll. Each year, the C.S. Mott Children’s Hospital National Poll on Children’s Health asks a national sample of adults to identify health topics that are a “big problem” for children and teens. The number one concern parents stated was cyberbullying/bullying at 61 percent with internet safety at 55 percent. Shame Nation is a perfect resource for you and your teen to read and discuss. Don’t forget book clubs! Let’s promote online safety and start instilling empathy in our cyber-place. 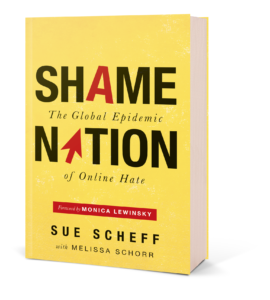 Encourage your library or local book club to read Shame Nation to learn more about building a kinder and safer experience online. Recent review from reader gives insights of Shame Nation on Goodreads.